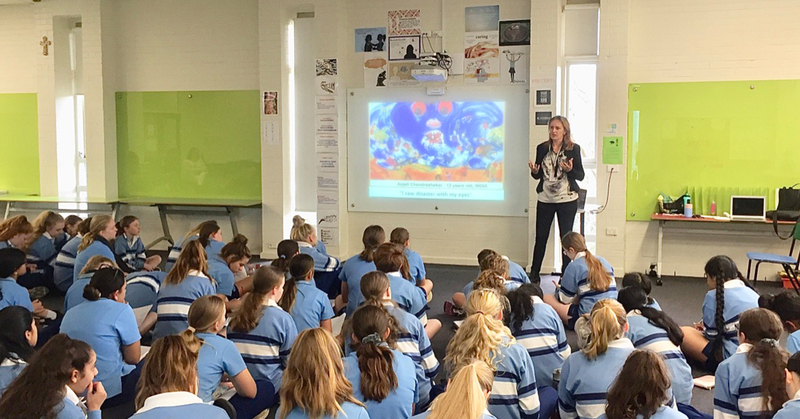 On 27 March, Year 8 students listened to Robyn Mansfield speak on disaster relief and prevention as part of their Interdisciplinary Unit (IDU) Day. Robyn is passionate about designing cities with vulnerable communities and specialises in elevating the voices of children in decision-making processes. Robyn has over 20 years' experience as a landscape architect, researcher, writer, community engagement specialist and as a disaster resilience and reconstruction advisor in Australia, Asia and South America. She left a lasting impact on the students. Below are comments from some of the students. I learnt that in the case of a tsunami there is more chance, in some countries, of women or girls dying because they haven’t been taught how to swim or climb a tree where men and boys have. I also learnt that there is no such thing as a natural disaster, the disaster is actually because of where that community chooses to live. I found the presentation very interesting in the way that different cultures and towns can affect how a disaster impacts their community. The presentation was informative about how many natural events happen every month even if they cause little damage. It informed me that many professions that aren’t existent are in need in different communities to help them recover their cultural ways. I share the speaker's opinion that we need a profession that helps rebuild communities, mentally and physically. I learnt so many new things that I will definitely incorporate into current humanities. Robyn inspired the girls to consider compassionately the needs of each community and look beyond the statistics. She left students with the thought, “Instead of working out what you want to be, think about the problems you want to solve".